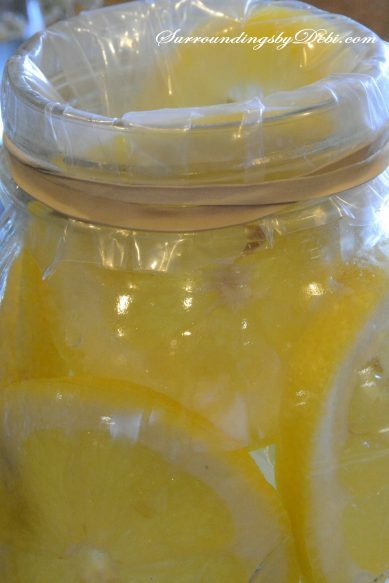 The look of fresh lemons just makes me think of summer. Their bright yellow color adds a special spark to a summer look. 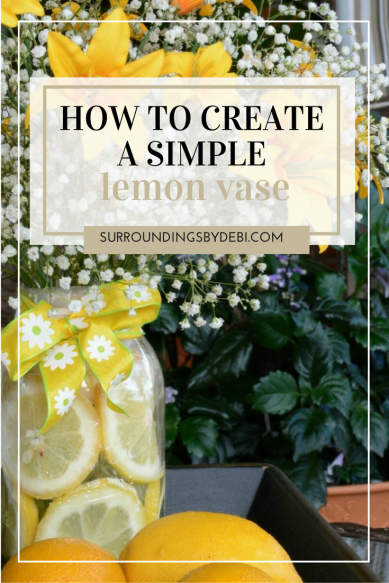 Today I am going to share a super simple and inexpensive way to add the freshness of lemons to a vase for any summer occasion. Insert the plastic bag into your vase. 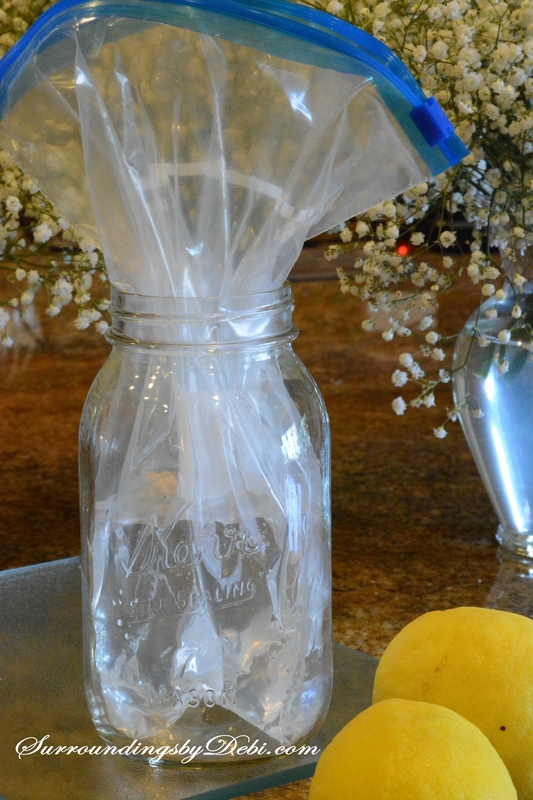 Once the bag has been inserted into the vase, fill the bag with fresh water. Slice your lemons into thin sections. 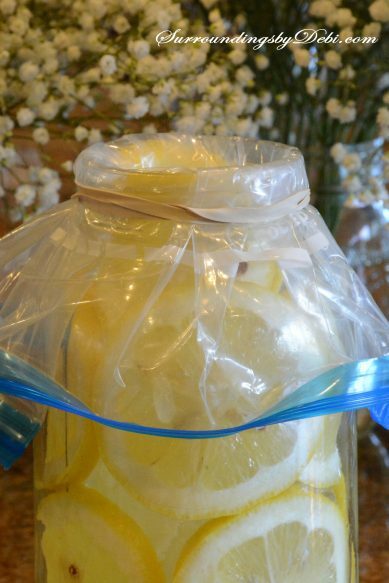 Using a spatula or wooden spoon, work your lemons into the vase BETWEEN the side of the vase and the bag you have inserted. Continue to work the slices of lemon around the vase until you have filled the vase with the lemon slices. 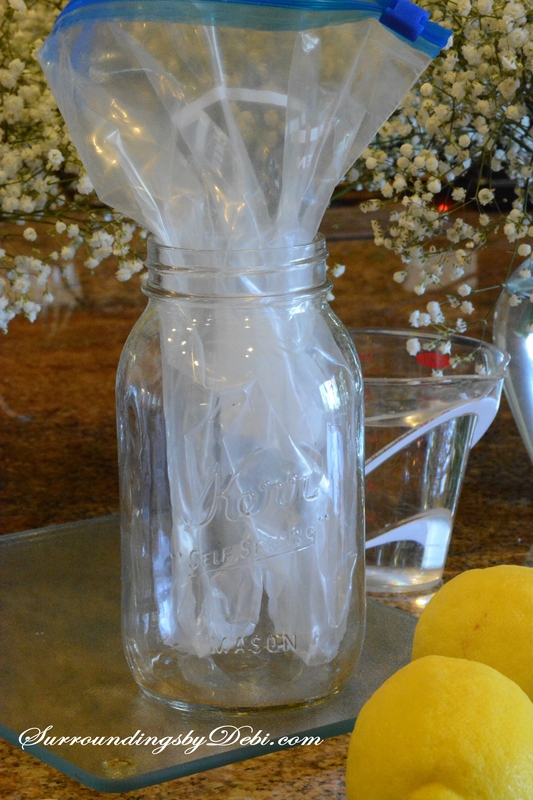 Fold the edges of the plastic bag over the top of the vase and secure around the vase with a heavy rubber band. Once you have secured the bag on the top of the vase, trim the bag to about a half inch from the rubber band. 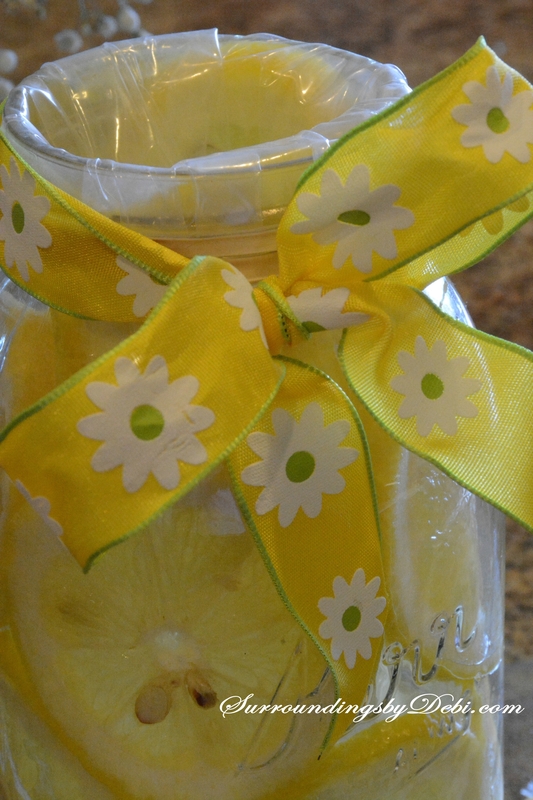 Add a decorative ribbon or raffia to the top of your lemon vase to cover the rubber band. 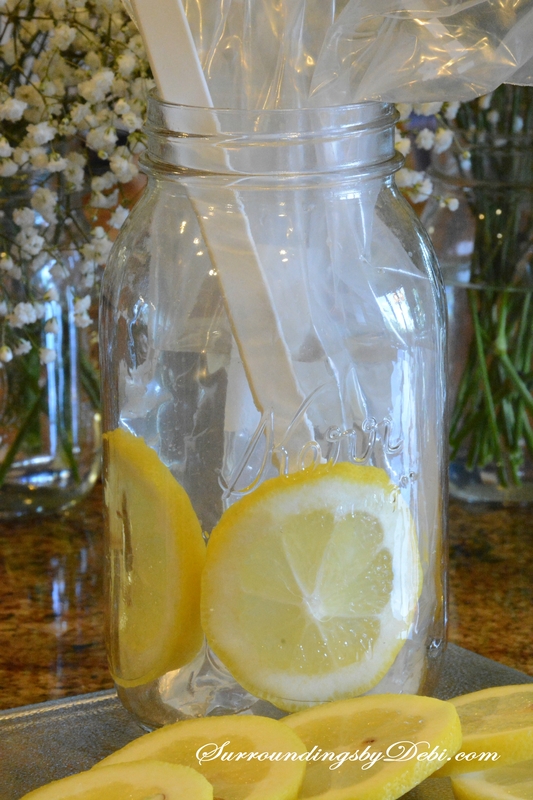 Insert the flowers of your choice into the water in your vase. 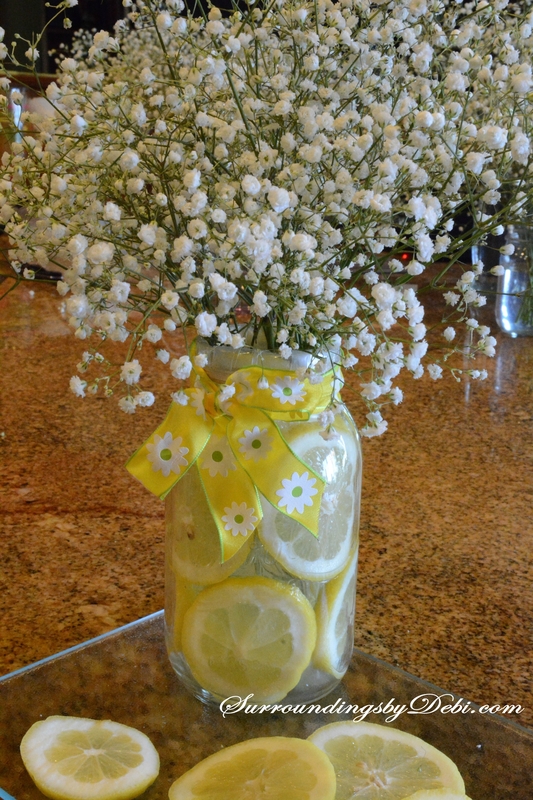 This makes a lovely summer arrangement for your table, kitchen counter, or any special event. Check out where I have used it HERE in my Citrus Tablescape. The Lemon Vase would work well for summer weddings and showers. And the fresh scent of lemons in the air adds a special touch. I added a few faux lilies and used it here for an added touch to an evening on the porch. And there you have a super simple Lemon Vase to add a wonderful summer look. 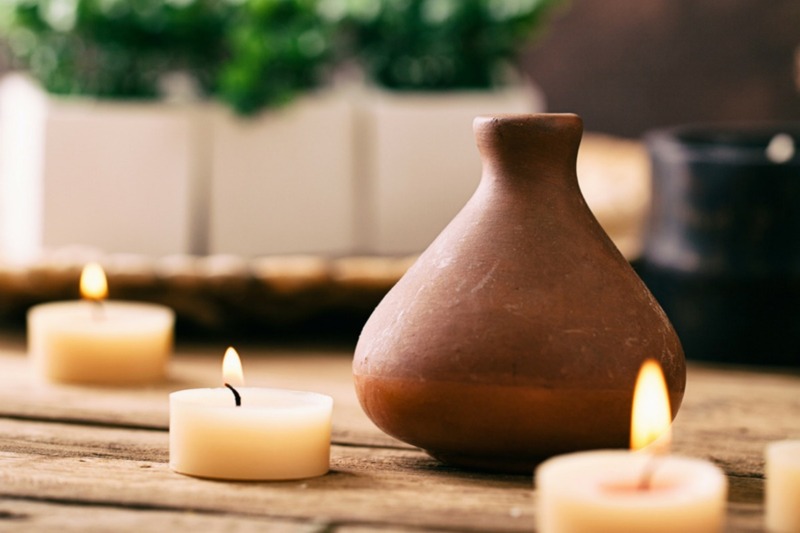 What simple ways do you have for adding a touch of summer to your home? 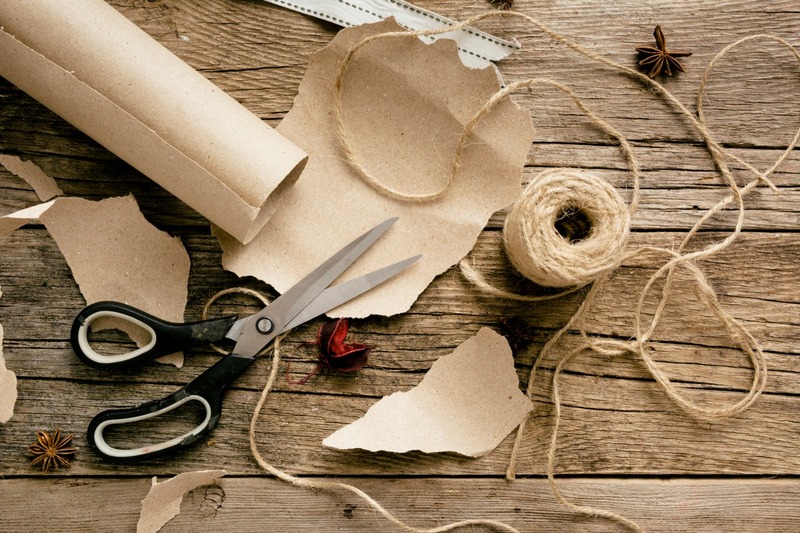 If you enjoyed this simple DIY project don’t forget to add it to your Pinterest Board. 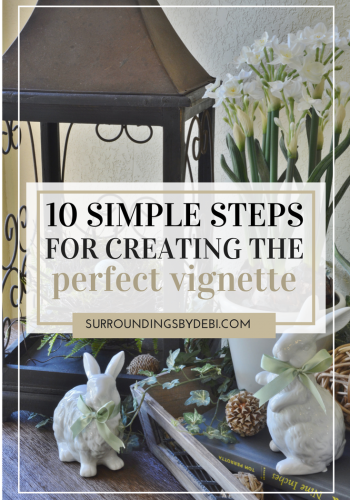 You can see all the wonderful things I am pinning HERE! « 1st Birthday Party – It’s a Homerun – with a Cubs Birthday Party! Thank you Katie! I appreciate you stopping by! Such a cute idea! Would the flowers last longer with the lemons in the water? Thanks for asking this question. I am sure there are others who have wondered this.It’s not usually recommended to mix flowers and fruits together. 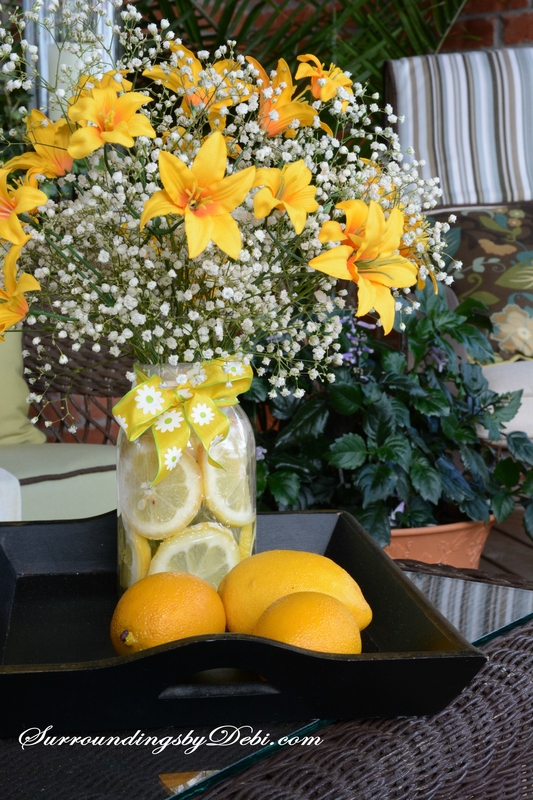 The deterioration of the lemons would cause the flowers to not last as long. Very pretty! I didn’t know the trick is to use a plastic bag. Thanks for the tip! You are welcome Beverly! Thanks for stopping by the party! Oh my gosh – I bet this smells amazing! they do smell wonderful and so much fun to make. Love this idea. How long do the lemons last in the arrangement? 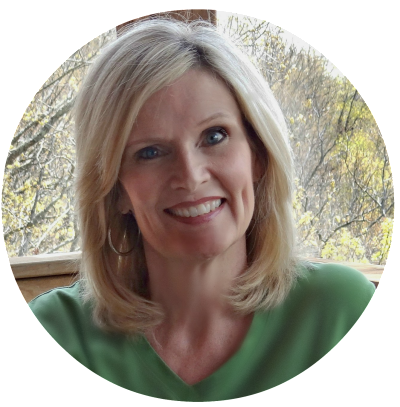 Erlene – You will be surprised how long they last. I have sometimes put a bit of water down between the vase and the plastic and they last for over a week! Thanks for allowing me to share with you at your wonderful party! What a great idea! It turned out so cute. 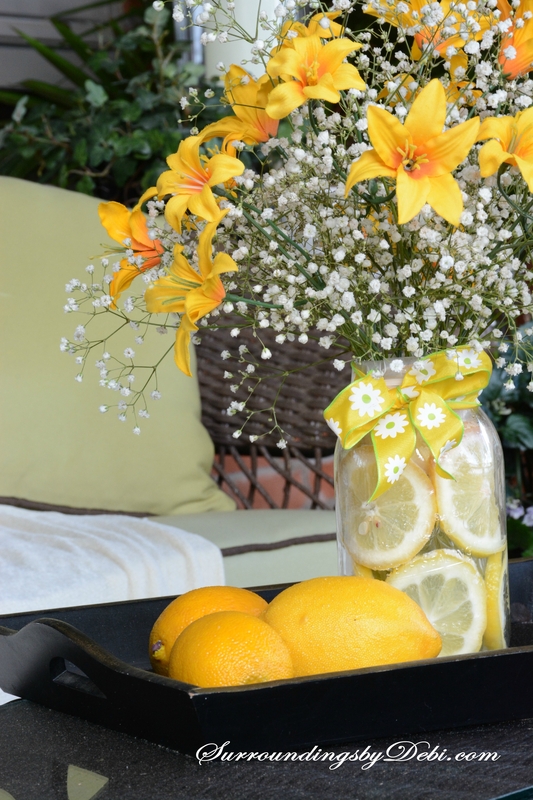 Thank you for sharing it and your citrus tablescape at to What We Accomplished Wednesdays. Have a great week! Thank you Deborah. It’s always a pleasure to join your party. LoVe this idea ! 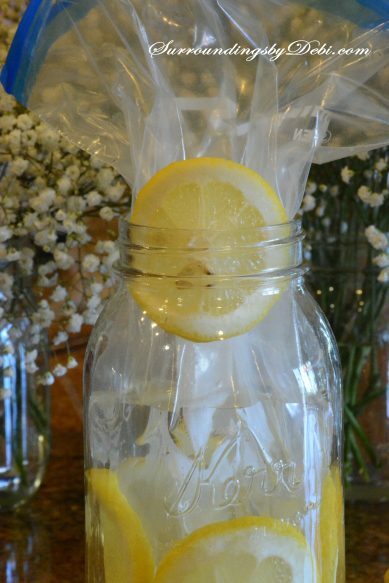 !….I actually have done this but I did not use the plastic bag, just added the flowers to the lemon water for a rehearsal dinner and the arrangement lasted for over two weeks !! You are so right Sharon. The flowers seem to last a long time when using the lemons. I have used the lemon vase for several occasions. Thanks for stopping by today. So beautiful and summery! 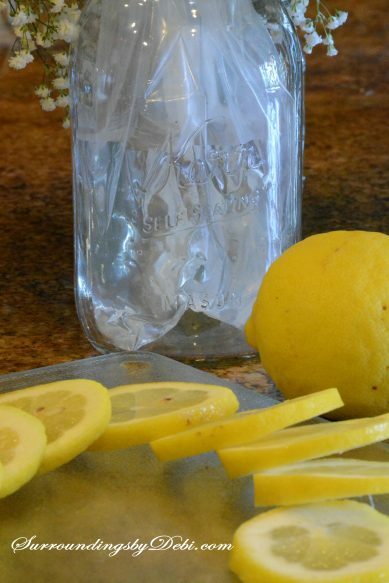 I love lemons and have often wanted to do this but never have! Now I want to try 🙂 Would love to invite you to our link up on my blog 🙂 Beautiful pictures too!! I just visited you lovely blog. 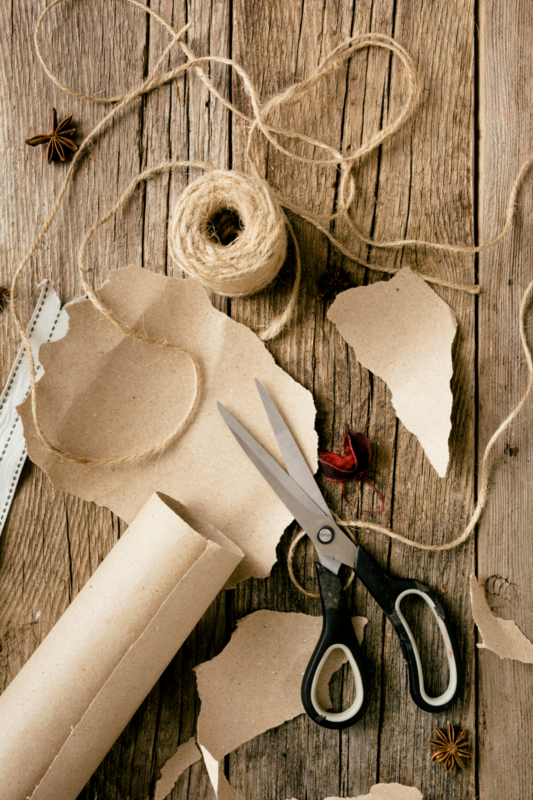 Your DIY projects are inspiring. I signed up to received your posts. 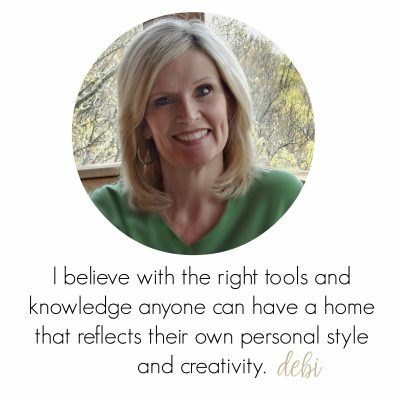 Debi, I just love this! I’d always wondered how to achieve this look. Thanks so much for showing me how to do it! I joined you again this week. Your blog is always an inspiration to me. 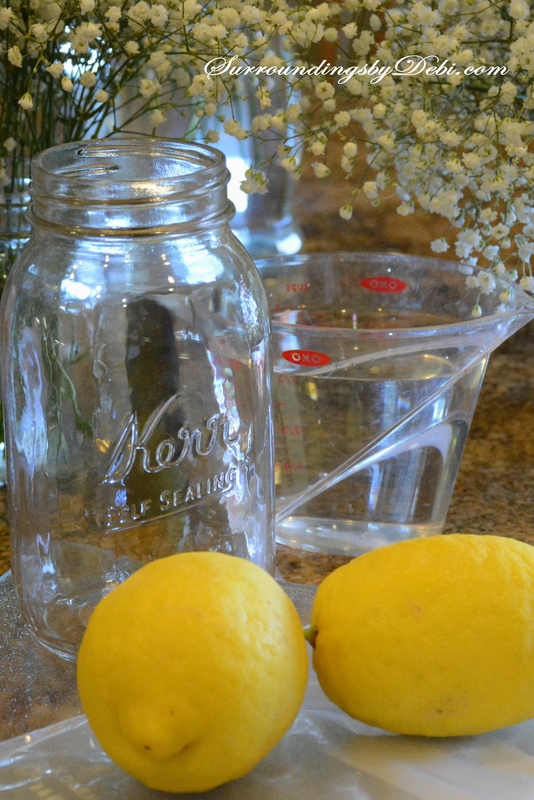 Thank you for featuring me Lemon Vase. 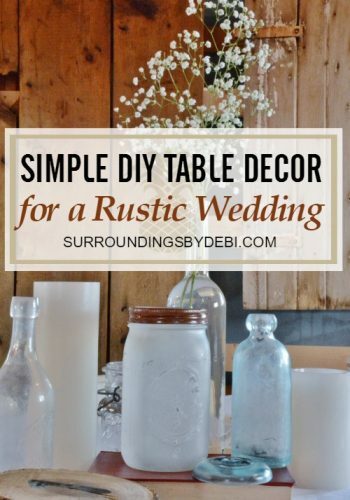 It is such a fun and easy way to enhance a table. I have used oranges and limes as well. 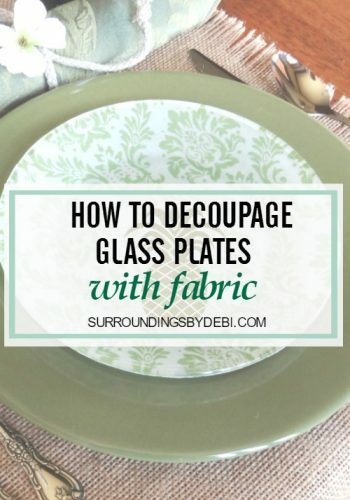 Love this – just purchased a lemon print tablecloth so this will be perfect. !!!! I would love a lemon print tablecloth! I bet this will look great with yours. Thanks for stopping by! Oh my goodness, this is so cute! I have seen these on Pinterest, but I have never seen the bag used before. I always wondered how the lemons/orange slices stayed in place so nicely! What a great idea! I am trying this for sure! Thanks! Great Kim! 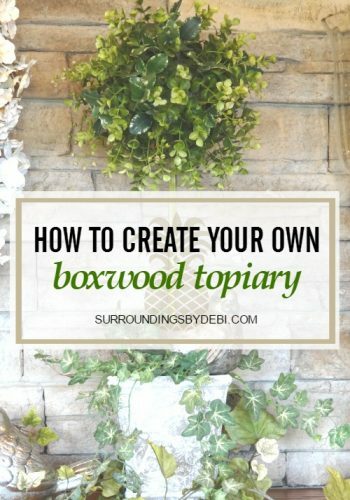 This is really and easy and inexpensive way to do this. That is SOO creative!! I’ve always wondered an easy way to do that! Thanks for the tips!! 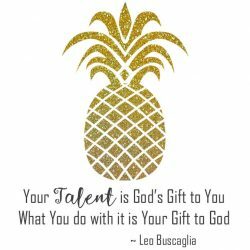 I would love it if you linked this up to my Motivate Me Monday linky party on IT’S A ginger SNAP. Thanks Katie! I just linked up to your party. It’s always nice to join a new party! Looks wonderful and very summery. Great idea! I’ve never seen the bag used inside the vase before. 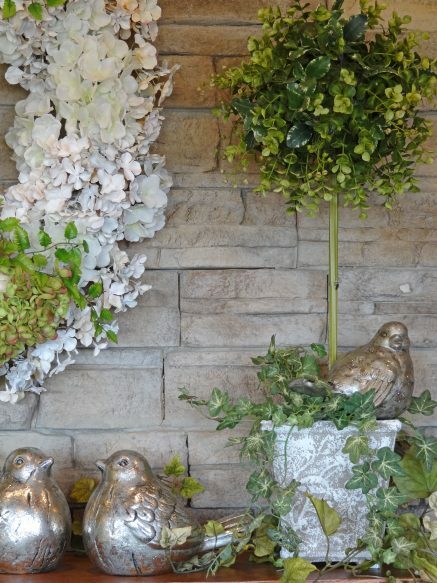 I like adding a touch of real-looking faux to fresh flowers/greenery too! DD – Thank you for visiting today. The bag makes it so easy to arrange the lemons – and I like easy! I just visited your blog today and I love the bathroom décor. 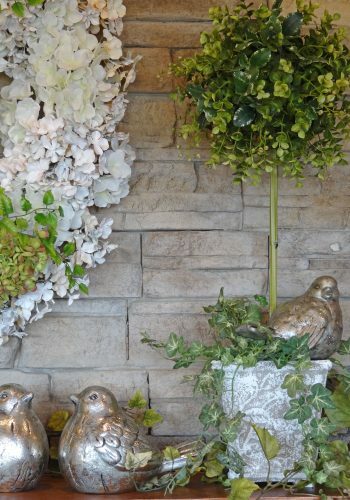 Like you I love to add seasonal touches to all of my rooms.